A company accused of the domain slamming scam made over $5 million over three years tricking companies into buying domains they didn’t need, it has been alleged. Consumer Affairs Victoria, an Australian state government watchdog, has reportedly taken Domain Register Pty Ltd to court, claiming tens of thousands of people had been conned by fake invoices. The company sent letters that appeared to be renewal notices for .com.au names, but were actually solicitations to buy the matching .com for AUD 249 ($186) a year, an Adelaide court reportedly heard. Domain Register, which appears to be (or was) a reseller of TPP Wholesale, made AUD 7.7 million ($5.5 million) from 31,000 suckers between 2011 and 2014, according to local reports. auDA, the .au domain registry, warned about the company as far back as 2011. An example of a bogus invoice attributed to Domain Register can be found here. It’s not clear whether the defendant in the case is linked to the Brandon Gray slamming outfit, which has also gone by names including Domain Registry of America, Domain Registry of Europe, Domain Registry of Canada and Domain Renewal Group. Brandon Gray lost its ICANN accreditation in 2014. The beneficiary of the long-running Domain Registry of America scam is finally at risk of losing its ICANN accreditation. ICANN has suspended Brandon Gray Internet Services, which does business as NameJuice.com, due to the “deceptive” marketing practices carried out by its “resellers”. The company won’t be able to register any gTLD names or receive transfers for 90 days. If NameJuice hasn’t sorted out its act by October 17, it faces the risk of losing its accreditation permanently. The company, you will recall, is the primary beneficiary of the “slamming” scam, which tricks customers of other registrars into transferring their names with confusing, invoice-style junk mail. Slammers have been operating under various names including Domain Registry of America, Domain Registry of Europe and Domain Registry of Canada for close to 15 years. I received one in 2011 from the “Domain Renewal Group”, which I blogged about here. 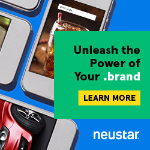 It was sued by Register.com in 2002 over the practice, was forced into a settlement with the US Federal Trade Commission in 2003, and has been involved in tangles with regulators all over the world for the last decade. But it seems ICANN’s hands were tied until Brandon Gray signed the new 2013 Registrar Accreditation Agreement, which gives ICANN’s compliance department more power over resellers. 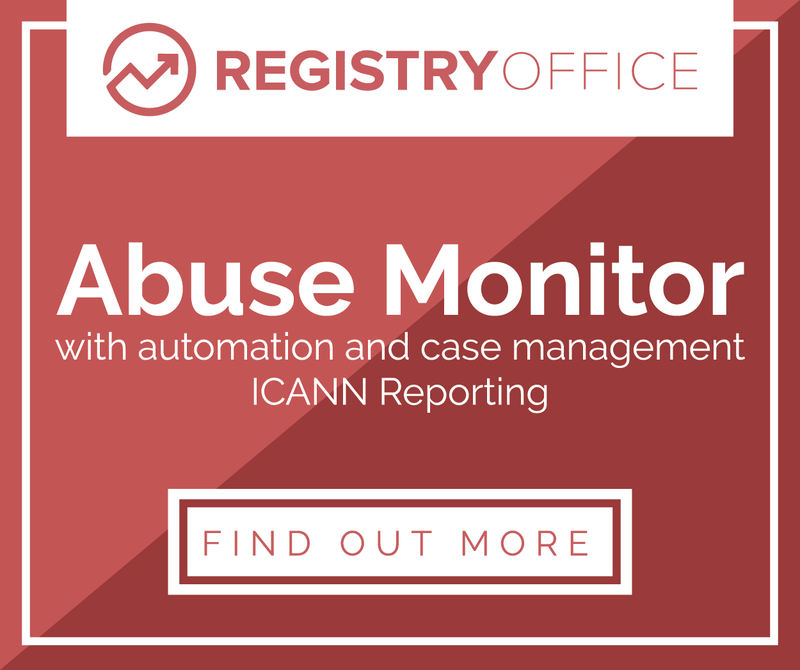 Since at least 2009, ICANN has received numerous complaints from Registered Name Holders, registrars, and various ICANN Supporting Organizations and Advisory Committees regarding the business solicitation practices of Brandon Gray’s resellers. Such practices were not specifically prohibited under the 2001 and 2009 RAAs. Section 3.12 of the 2013 RAA, however, requires registrars to ensure its reseller’s actions comply with the RAA, as well as the Registrants’ Benefits and Responsibilities Specification, which protects Registered Name Holders from false or deceptive practices. ICANN fingered “reseller” Registration Services Inc as the party behind DROA and the other slamming scams. In order to cure the latest breach, NameJuice has until August 8 to provide a tonne of information about Registration Services, including its certificate of incorporation, samples of its mailshots, and details of how a sample of specific domains came to be transferred. In order to avoid losing its accreditation by October 10, the company will also have to promise to force its reseller to stop its deceptive marketing and provide ICANN with samples of future mailings. NameJuice has 13 tasks in total to comply with to avoid termination proceedings; it’s looking promising that ICANN will finally shut down this blight on the industry just a few months from now. The irony is, of course, if NameJuice loses its accreditation, all of the names that were obtained under false pretenses will not revert naturally to their original registrar. Instead, if ICANN follows its standard practice, they’ll be transferred in bulk to a third registrar. You can read the breach notice here and the suspension notice here. Domain name slamming is alive and well in the ICANN-accredited registrar community. 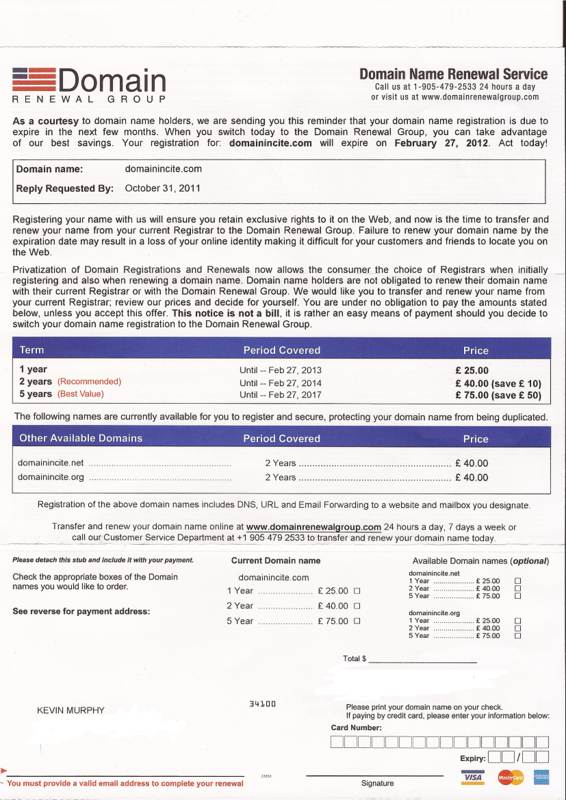 I’ve just received a letter in the mail offering me the chance to transfer and renew domainincite.com for the knock-down price of £25 ($38) a year. It’s Domain Registry of America again, still slamming almost a decade after it was first sued for the completely unethical practice of conning people into transferring their domain names. The letter looks like a renewal notice. Besides ostensibly coming from “Domain Renewal Group”, it also contains the prominent text “Domain Name Renewal Service”. Domain Renewal Group and Domain Registry of America are one and the same – fronts for the ICANN-accredited registrar Brandon Gray Internet Services Inc, dba NameJuice.com. The letter, as you can see from the scan, is a little less bogus than the ones DROA started sending out back in 2001. The text states now much more clearly that “this is not a bill”. But domain slamming has always relied upon people not reading the letter properly and/or not understanding the intricacies of domain transfers, and this is no different. DROA’s business depends upon its letters finding their way into the hands of gullible individual registrants or accounting departments that will blindly pay official-looking notices. At the prices the company charges – pretty much the most expensive in the industry – very few people will have transferred their domains because they thought they were getting a good deal. There have been numerous complaints and lawsuits against DROA over the last decade. The mailing must not appear again in its current form. And last year, the .ca registry CIRA terminated Domain Registry of Canada, another Brandon Gray front, for slamming .ca registrants using the same methods. So isn’t it about time ICANN shut these muppets down too? Unfortunately, ICANN can only use contracts to enforce compliance, and I’m not sure there are any sticks in the 2001 Registrar Accreditation Agreement that it can use to beat them. DROA has plainly breached Go Daddy’s Whois access policy by slamming me (the letter was sent to my Whois billing address, not my actual residence), but I don’t think there’s much Go Daddy can do about that short of suing. As far as I can tell, Brandon Gray, which has about 130,000 domains under management, got its ICANN accreditation in about 2003. It was previously an eNom reseller. So its accreditation is probably going to be up for renewal within the next couple of years. Fortunately, ICANN has just this week introduced stricter new accreditation application rules that are specifically designed to weed out the scumbags. Any company or individual with a track record of dishonesty is no longer welcome at ICANN. So if there’s nothing that can be done before then, at the very least when Brandon Gray’s accreditation expires ICANN should not renew it. What’s more, other registrars should lean on ICANN to make sure Brandon Gray is shown the door. It’s been bringing their industry into disrepute for the best part of a decade and it’s time for it to stop.